ASICS offers some of the best athletic shoes for runners, regular walking individuals, and athletes who need support comfort and responsive foot cradling on the go. 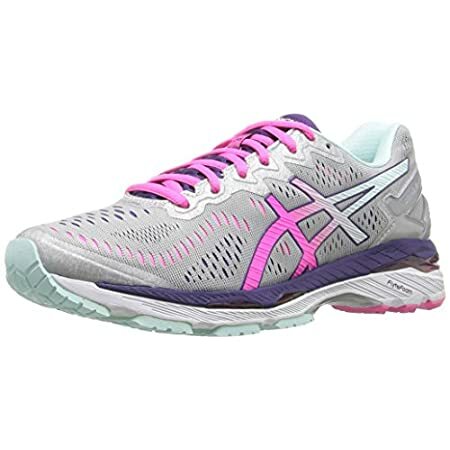 This ASICS women Gel Kayano 23 running shoe is another great shoe in the gel Kayano shoe line that offers high-end performance for the narrow feet especially with over pronation style when the foot roll inwards during the gait cycle. It is equally supportive for broad feet but may be more fit and need some extra 0.5 or 1 number greater to fit the foot in easily. As a whole, it’s a perfect snuggly fitted shoe for ultra-light support, responsive push for keeping the running process easier and smoother no matter how much the athletes have to cope with the running time and distance. The appearance of the shoes matters a lot when it comes to choosing the shoe for women. This shoe takes care of that quite perfectly giving it a sporty yet stylish look so that women can wear it as a casual shoe or running shoe wherever they go. The 16 different available colors and upper designs offer greater choice for you to choose what you like. The fluid fit mesh fabric on the top side with floral print and soft feminine color makes it a great choice for women. The mesh fabric keeps the shoe well-aerated and sweat free and offers a durable surface that will not get cracked with the passage of time. The sole has a well-formed impact guidance setup that offers linked components to make sure the natural gait combines each component to support and relieve automatically to keep the foot easy throughout the cycle. The fluid ride midsole is a combination of elements that offer cushioning, bounce, support and lightweight construction to keep the pressure on the foot at the least level. The insole provides maximum support and also allows sufficient bounce back so that the foot stays away from impact and pressure as the foot strikes the ground or takes off for the next step. The rear foot and forefoot are supported and comforted by the gel cushioning system that assures your foot stays easy and relaxed and free of pressure no matter how much force you are applying to it for quicker, faster and aggressive steps forward. The gel cushions make sure to absorb the shocks and impact forces and keep the foot transition easier and lighter. The outsole is made up of durable, flexible and supportive rubber whereas the fly foam layer along with rugged outsole and toe support keep the foot easy, supported and allows more bounce and faster walk without exerting a lot of pressure on the heel and toe area. The outsole has been designed to assure that the foot stays firm inside and will not be experiencing much strain as the forces are diffused to keep it easier to walk. The rugged, well-designed sole helps in a safer walk on any kind of ground and keeps the user stable during the walk. With the help of gel cushioning on the rear and forefoot area, the fluid ride midsole and flexible outsole, the shoe offers high-level support with least weight on the foot. The heel clutch setup offers a comfortable fit for the heel and keeps it safe with padded collar and gel sole for better wand easier foot transitioning. The lace closure paired with the multi-directional durable mesh fabric offers glove-like fitting for better and safer performance. Overall this shoe is perfect for those who have narrow feet and need support and comfort while running on a wide range of ground levels. The rugged outsole offers greater grip and stability on the ground whereas the inner sole keeps the foot easy and cradles it comfortably to keep the impact to the minimum. The shoe is perfect for those with overpronation issues but may not work for under pronation. According to the buyers and users of the shoe, this turns out to be narrower than ASICS 22 so if you have a wider foot you may have to buy a larger size or else it may cause some pressure on the foot. On average the shoe has been rated and given 4 out of 5 star based on its performance and level of comfort. ASICS GEL Kayano 23 running shoe is no doubt a great addition in the gel kayano line. Though people have shown some concerns regarding the narrow design that may not allow you wear the true size if one has a wider foot but it fits perfectly if you have narrow feet. The insole, the support, its low-top arch and the fluid ride midsole offer greater support, support manage foot posture and keeps the foot impact free during the walk. It is lightweight and makes sure the foot will not have to bear with heavy materials and their pressure as well. All these features and components assure that women can surely rely on this wonderful looking shoe that is perfect for running for miles without getting foot pain or pressure on the calf muscles as well. Though it is always better to make sure you find the most suitable size for your feet so that there are no troubles regarding the sizing and width that is crucial to keep your foot relaxed.